The halibut’s (Lat. Hippoglossus hippoglossus) habitat on the ocean floor in the North Atlantic and in the Barent Sea, from Svalbard, Bear Island and Murmansk to the Biscaya Bay, and off the Greenland coast, the North American coast from Labrador in Canada to Cape Cod in the USA. It is found all around Iceland, mostly off the west, southwest, south coasts. It prefers sand, gravel or clay floors, but sometimes it is found in more rugged lava surroundings. It also swims toward the surface. Its habitat lies between 20-200 metres depth at temperatures of 1-15°C, 3-9°C are the ideal temperature. The halibut migrates all over the sea. Fishes tagged in Icelandic waters have been caught off the Faroe Islands, East and West Greenland, and off the coast of Newfoundland. Tagged halibuts from Canada and the Faroe Islands have been caught in Icelandic waters. Young halibuts stay in shallow areas to the age of three to five years, when they migrate to the deeper seas. In spring and summer the large halibuts migrate to the shallow waters and return in the autumn. Large halibuts seek strong ocean currents. 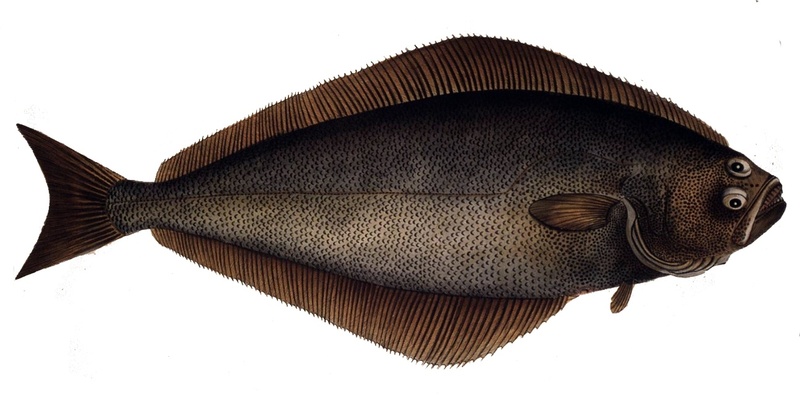 The halibut is very voracious and almost omnivorous. It feeds off perch, cod, haddock, lumpfish, catfish, capelin, sand eel, crustaceans and other animals from the ocean floor. Seals, small whales and Pleurotrematas prey on the halibut. The halibuts grow rather fast and have a life span of 25-30 years. They probably grow much older, because it is highly difficult to decide how old the largest of them are. The largest halibut caught off the Icelandic coast (1935) weighed 266 kilogrammes. The greates catch (1964) in the Norway, Faroe Islands and Iceland area was 36 thousand tonnes.